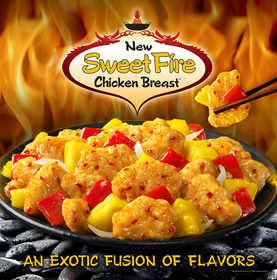 Recently, I tried a new dish at Panda Express -- the Sweet Fire Chicken. YUM. But I knew that it was somewhat unhealthy and probably easily recreated in our kitchen. I was right! Other than knowing for sure it had pineapple, red bell pepper, onion, chicken and sweet chili sauce, I wanted to make sure I was not missing anything. I turned to google to see if anyone else had created a recipe for it yet. I found this great resource and used this recipe to help me formulate a healthier chicken replacement for the deep fried chicken I know is in the original! Chop and prepare all ingredients before starting. Heat oil in pan on stovetop. Mix flour, salt and pepper in a gallon ziplock bag. Add chicken pieces and coat evenly. Once pan has heated, add the chicken pieces. Throw out the leftover flour mixture. Cook 4-5 minutes, stirring several times to cook chicken. If the pan surface gets dry, spray some additional cooking spray on the surface or add a little bit more oil. Once the chicken has browned, add the bell pepper and onions. Stir in and cook about 3-4 minutes. Add the sweet chili sauce and stir. Then immediately add the pineapple and stir. Allow to cook for 2-3 minutes. Serve over rice immediately. SO yummy. Definitely adding to our list of regular dinner menu items around here! sounds tasty. glad you were able to find a healthier alternative. Thank you for this recipe! I just made it and it was wonderful!! WOW this is just like Panda Express! I've been craving this dish but everytime I'm near a Panda Express (which is quite a trip for us) they're not serving this dish. I decided I wanted to re-create it at home and what I thought of in my head is very close to what you posted so I used yours as a starting point. PERFECT! Thank you so much for sharing! 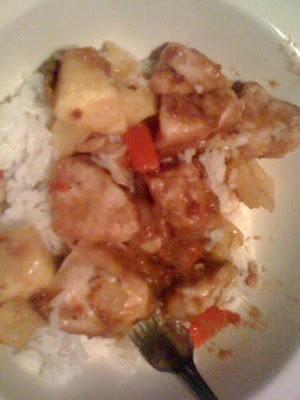 I made this dish last night and it was AWESOME. My husband is not big on red bell peppers but he ate everything last night and commented that this is a do-over.